For the coffee connoisseur, a grind and brew coffee maker can be the perfect gift. You get real beans automatically ground to make fresh, delicious coffee at a moment’s notice. What more could you want? We’ve done our research in order to bring you these grind and brew coffee maker reviews and help you choose the one that’s best for you. Here’s some information to get you started in your search for the perfect grind and brew coffee maker. Cup Capacity: This refers to how many cups of coffee the machine can make at once. This will tell you if it’s a personal machine or if it’s suited to multiple coffee drinkers. Can’t get enough? Choose a bigger machine. Finish: This is the machine’s color or finish. This will tell you what most of the machine looks like, so you can properly match it to the rest of the appliances in your kitchen. That’s a plus! 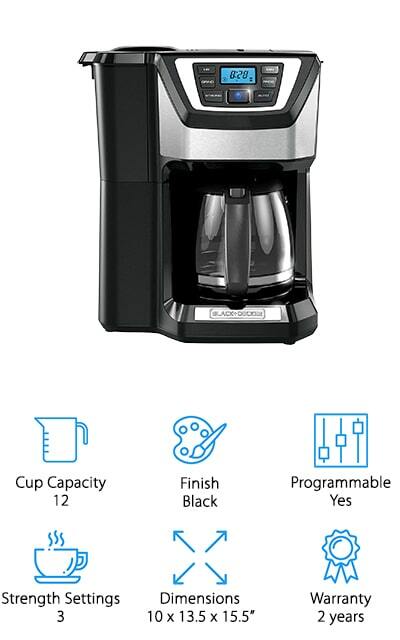 Programmable: If a coffee pot is programmable, you will be able to set a schedule or certain time for your coffee to start brewing in the morning. It’s useful for people who are on the go! Strength Settings: Strength settings may allow you to change how your coffee brews so that it tastes different. You can usually set the coffee maker to brew darker, bolder coffees from the same beans as your mild drinks. Dimensions: How big is the coffee pot? This is important if you have limited counter space, or you’re clearing out a spot especially for this machine. Check this out to see where it will fit in your kitchen. Warranty: A warranty means a company stands behind their product. If something breaks or stops working within the given time frame, you can get a replacement at no additional cost and with little to no hassle. Now we can start the grind and brew coffee maker review! We’ve scoured the market to find only the best makers so that you can make a choice that you’ll love for years to come. Get your favorite coffee beans ordered before you check our out top pick and budget pick because those are the best of the best. The rest of our list is amazing as well, so don’t stop there! 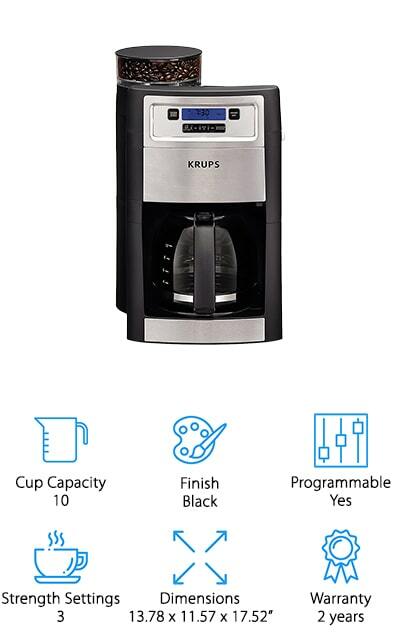 KRUPS arrives in first place with the best grind and brew coffee maker that we could find. You can make up to 10 cups of coffee at a time, though there are a few different settings. If you only want a few cups of coffee, you can choose to make anywhere from 2 to 10 cups at a time. It’s up to you! The conical burr grinder allows you to choose the fineness of your coffee grounds, from the very coarse to the extremely fine. This will affect the taste! You can also choose the strength of the brew, from mild to medium and strong. This coffee pot will keep your coffee warm for up to two hours after the brew is finished, so you’ll always have warm, delicious coffee on hand! It even has an auto-start function to get your mornings started right. Check out this amazing drip coffee maker and never settle for pre-ground coffee again. 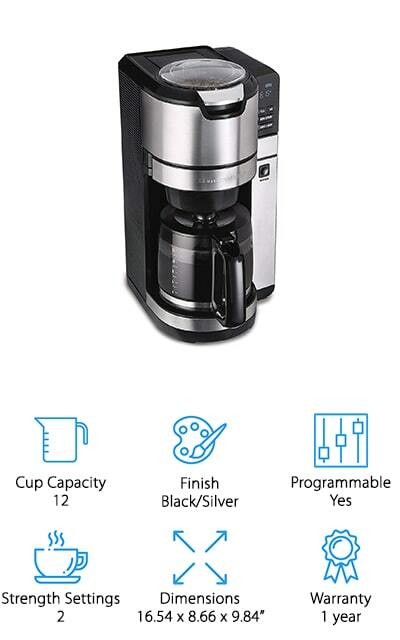 You can get this Black+Decker grind and brew coffee maker at an affordable price to make your mornings that much better. The coffee grounds fall right into the filter basket, so there’s no complicated clean-up. You can get your coffee started right away with almost no wait. Use it with your favorite whole beans for quick, delicious coffee no matter what time of day it is. You can also set it to brew ‘normally’ with pre-ground coffee if that’s what you’re feeling like in the morning. Plus, you can customize every aspect of your brew with strength selection, so you can brew regular coffee, bold coffee, or strong, black coffee. Every pot can be different! You can set the auto-brew feature so that you wake up to your coffee brewed and ready for you. Everything about this coffee pot has been developed with your ideal day in hand, no matter what time you choose to indulge. 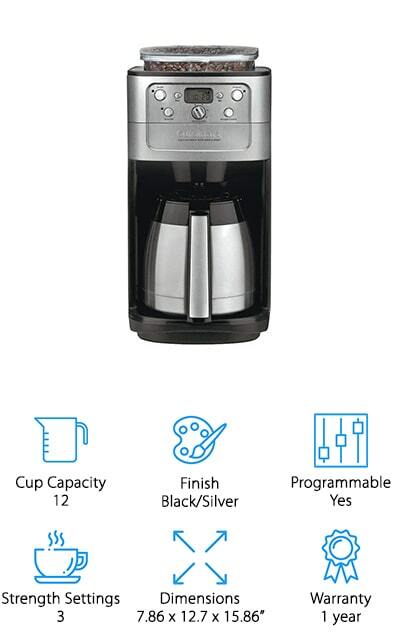 Cuisinart makes one of the best rated grind and brew coffee makers on the market right now, with a full 12 cups of coffee ready for you whenever you want it. You can fully program your coffee pot to brew at times throughout the day, and you can also control the way that the beans grind down with the built-in burr grinder. Select the strength that you prefer and get your ideal cup of coffee without having to grind the beans yourself! The water coming into the pot filters through a layer of charcoal, removing any contaminants so that your coffee tastes great no matter what. It includes a gold-toned coffee filter that’s sleek and easy to clean, as well as a measuring scoop in case you want to use the pre-ground coffee options. There’s not much that this grind and brew coffee maker can’t do, so check it out today and start enjoying your mornings again. Gourmia makes this amazing tech-savvy coffee pot that you can control from your phone. If you have any sort of voice-control system in your home, this coffee maker will integrate right into that. This will allow you to control the brew cycle from the app and with your voice no matter where you are in the house. The maker will keep your coffee warm for up to 30 minutes after it finishes brewing. It’s got a sleek, stainless steel body with black accents, as well as a clear water gauge so you can figure out how much water you need to add. If you’re busy, check out this top rated grind and brew coffee maker that you can control remotely! We love the idea of this coffee maker. It’s easy to use and great at keeping you on time in the mornings. You can make 10 cups of coffee at a time, from fresh beans or pre-ground blends. The CC-10FR by Conair is a great grind and brew coffee maker to get your brew just right. You can brew up to 10 cups, though if you want to make a smaller amount you can make between 1 and 4 cups as well. The carafe is stainless steel, though it is double-walled and insulated so that your coffee stays the perfect temperature hours after your brew it. The permanent filter is gold-toned, which allows you to make the freshest coffee possible from your built-in grinder. 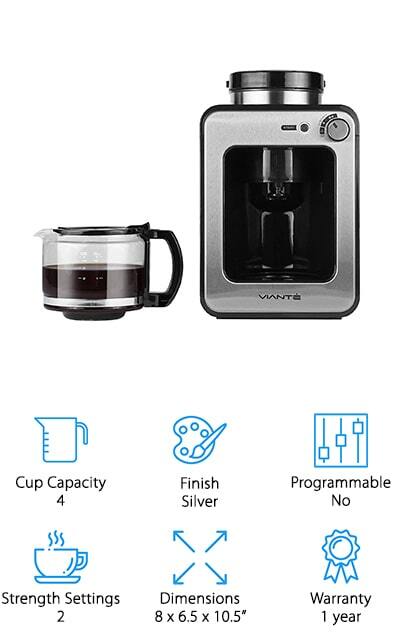 You can program this coffee pot to start brewing up to 24 hours in advance, so it’s ready when you want it. In addition to making coffee from freshly-ground beans, you can use the pot to make coffee from pre-ground coffee as well. Combine all of this with a comfort-grip handle, and you’ve got an amazing coffee maker that will give you a delicious wake-up call every single morning! This Grind and Brew coffee maker by Hamilton Beach has a leg up on the competition with a grinding chamber that rinses itself automatically, making sure that you get a fresh grind each and every time. 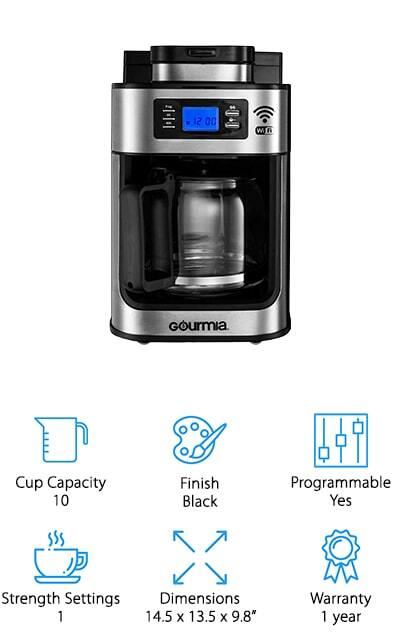 After it grinds all of your favorite whole coffee beans and brews you a delicious 12-cup pot of coffee, the machine rinses the grinder so it can continue to deliver the best-tasting coffee each and every time. You can program it to wake you up in the morning if you set it up to 24 hours in advance so that you have hot coffee first thing. You can choose to make a regular-strength brew or a bold brew so that you get the exact cup that you want. You can also make between 1 and 4 cups if you just want a pick-me-up, rather than the whole 12 cups at a single brew. It’s an amazing little coffee pot for any kitchen. This top grind and brew coffee maker by Cuisinart will keep your coffee warm for a long time! The 12-cup carafe is double-wall insulated with a stainless steel exterior that will fit perfectly into your kitchen décor. It comes with a burr grinder that makes fresh, perfect coffee grounds from up to 8 ounces of beans at once. You can choose one of 3 strength settings to make sure you’re getting the cup of coffee that you want. If you’re using pre-ground coffee, you can use the included measuring scoop to get the perfect amount. If you’re grinding fresh beans, you can choose how fine you want it to grind, so that you can accurately choose how strong and intense you want your coffee to be. It also includes a charcoal filter for contaminant-free water and a gold-tone filter for fresh brewing. Go with a quality grind and brew coffee maker and choose the Cuisinart DGB-900BC. 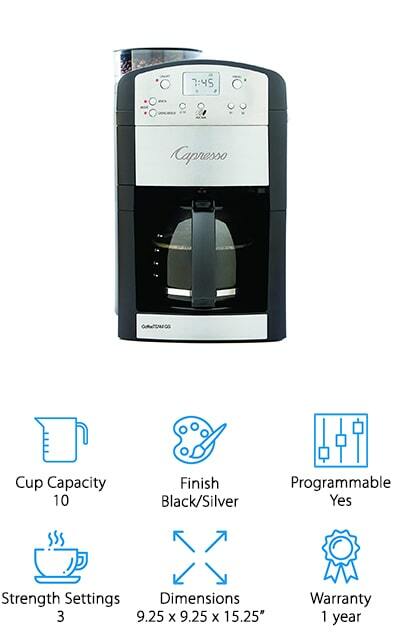 Capresso makes this automatic grinder and coffee maker. If you want the most flavor from your coffee, you’re going to need to go with a grind and brew that doesn’t pre-grind the beans. This allows you to get the most flavor and richness out of the bean. 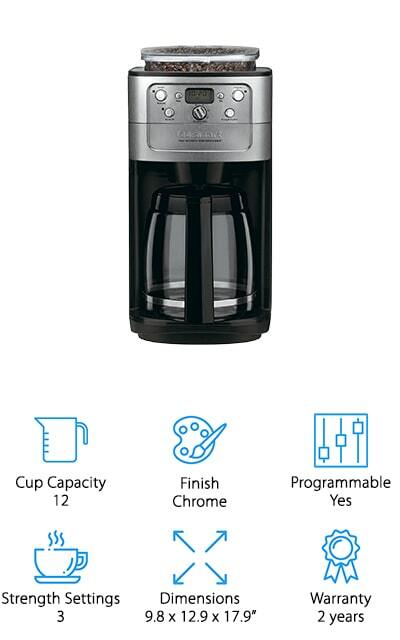 There is a conical burr grinder in this coffee put, with direct-feed technology that saves space and allows you to get 10 great cups of coffee at a time. You can program the clock and timer so that you can wake up to your favorite cup of coffee. The gold tone filter is easy to clean and ensures that you’re getting the freshest brew. The carafe is glass and has an ergonomic handle for easy pouring, and you can set the different grind and strength settings depending on how you like your coffee. The bean container holds up to 6 ounces, so you can refill the cup less often. 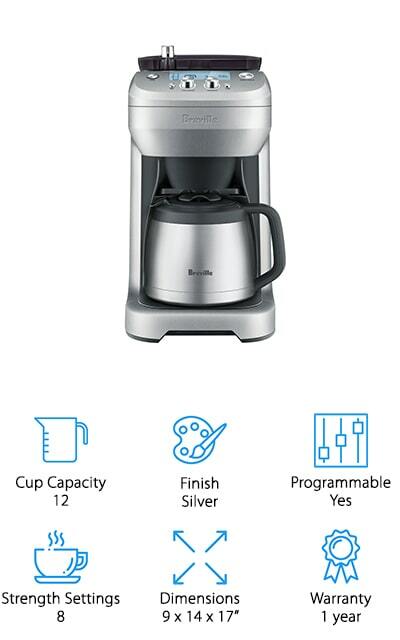 Breville makes this amazing grind control coffee maker that allows you to make the perfect, customized cup of coffee. You can choose six different grind settings, perfect for light or dark roast beans. Each bean grinds a little differently, so this is a great feature. There are 8 different strength settings so that you get your coffee as bold or dark as you want it. You can brew one cup at a time if you’d like, and you get to control how hot the coffee is when it brews. If you have a coffee artisan in your life, this is the coffee pot to get. That’s why we’ve included it in our Breville grind and brew coffee pot reviews. You can make 12 cups at a time and program every part of the brewing process, for the perfect cup first thing in the morning. This even includes a removable catcher and storage hopper for all of your coffee beans! Last but not least, we have the Viante Grind and Brew. If you have been scouring our list for the perfect smaller grind and brew, this is the maker that you want to buy. 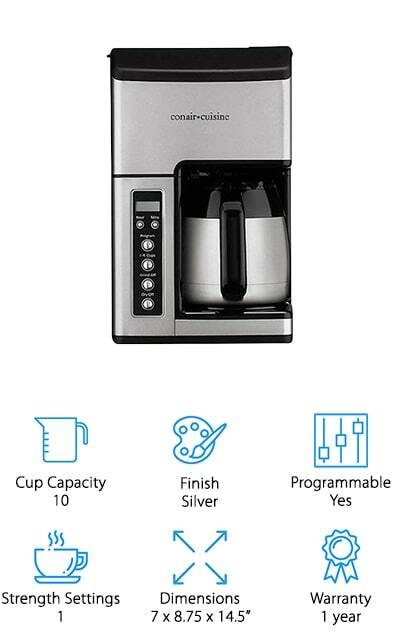 You can make 4 cups at a time, so you won’t be wasting any of your precious beans. You can also use pre-ground coffee if you choose. Don’t brew a ton of coffee – you can’t drink it right away, and it will lose its freshness. Instead, make smaller amounts and then come back for more later. It’s also convenient for smaller living spaces because it doesn’t take up much counter space, leaving you room for other appliances! Plus, you can choose from two strength settings to get the cup of coffee that you’ve always dreamed of. This includes a setting for different grinds as well. Why make a mediocre cup of coffee? You don’t have to with the Viante Grind and Brew!